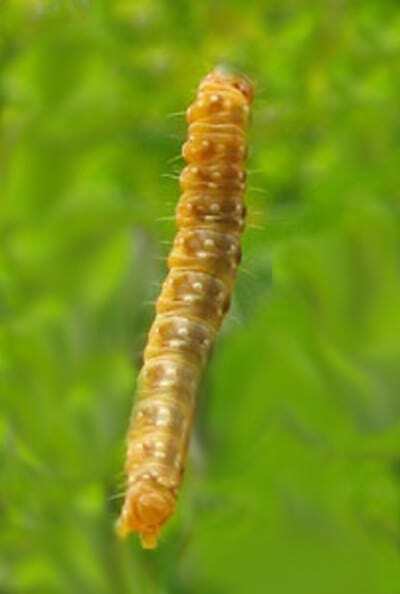 The spruce budworm is one of the most destructive native insects in the northern spruce and fir forests of the Eastern United States and Canada. Periodic outbreaks of the spruce budworm are a part of the natural cycle of events associated with the maturing of balsam fir. The States most often affected are Maine, New Hampshire, New York, Michigan, Minnesota, and Wisconsin. These outbreaks have resulted in the loss of millions of cords of spruce and fir. Balsam fir is the species most severely damaged by the bud-worm in the Eastern United States. White, red, and black spruce are suitable host trees and some feeding may occur on tamarack, pine, and hemlock. Spruce mixed with balsam fir is more likely to suffer budworm damage than spruce in pure stands. The newly hatched budworm larva is very small and difficult to find because it bores into and feeds on needles or expanding buds. The adult moth has a wing span of 2 centimeters. It is usually grayish with dark brown markings. Some moths are brown or reddish with gray markings. Males and females occur in about equal numbers.